Corfu Greece Things To See And Do. Corfu offers plenty of things to see and do to keep you active during your stay; from water parks and golf courses to monasteries, museums and palaces, there is something here to suit all tastes and interests! At over 1000 metres high and covered in snow for some of the winter months, Mount Pantokrator is the highest peak on Corfu and dominates the northern end of the island. On a clear day, the view from the summit is quite spectacular; it is possible to see the islands of Paxos and Anti-Paxos to the south, whilst to the north, you can see the small islands of Mathraki, Erracusa and Othondi. Occasionally, to the west, it is possible to the southeastern tip of Italy - a land mass that is over eighty miles away. There is an old monastery at the summit of the mountain, but the major feature is a towering radio mast. 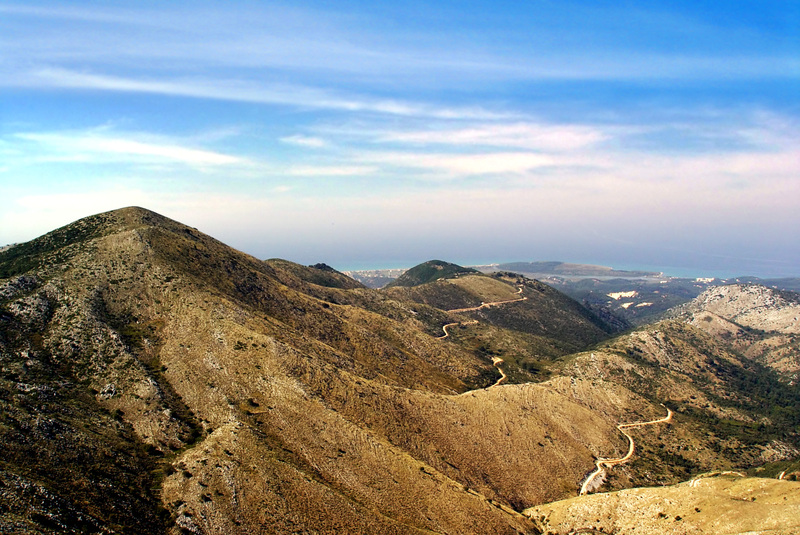 The route to the summit takes you through several small villages, notably Strinilas which is the highest village on the island. This charming traditional village makes for a perfect place to stop for a meal or refreshments. Situated at in the picturesque village of Gastouri the Achillon Palace was built in the 1890's as a summer retreat for "Sissi", Austria's Empress Elizabeth whose uncle was King Otto of Greece. It was also the birthplace of Prince Phillip. Tragedy struck in 1898 when the Empress was assassinated and the palace was left empty until 1907 when Kaiser Willhelm II of Germany purchased the property. A keen swimmer, he built a jetty on the coast below the palace from which to launch his yacht on swimming parties. The palace enjoys commanding views over Corfu Town and is surrounded by magnificent gardens that feature many Roman style statues. The interior of the palace is furnished in a classical and luxurious style. The palace has in more recent times been used a film set, notably for the James Bond film "For Your eyes Only". 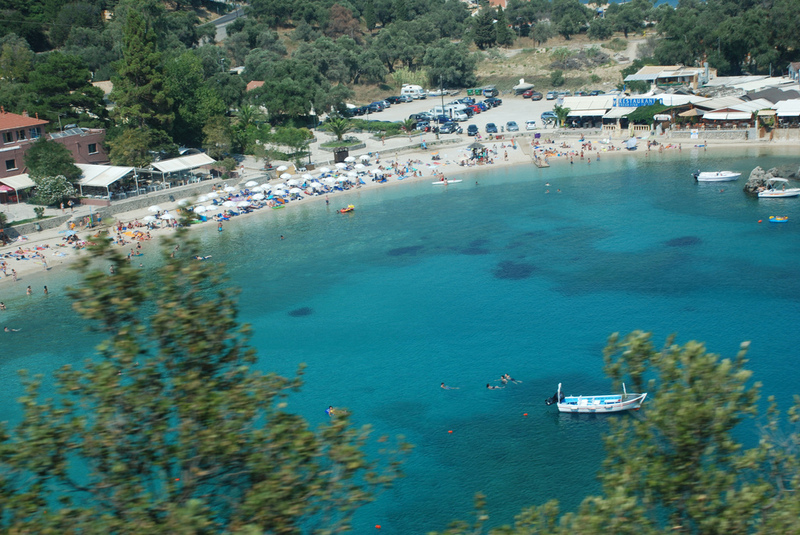 The beach at Paleokastritsa is busy during the peak season. Possibly the busiest and most popular tourist destination is the town of Paleokastritsa. Spread over three large bays that are surrounded by lush green countryside, this is one the beauty spots of the island. Accordingly, it is thronged with day trippers during the peak holiday season, whilst many yachts and motor cruisers will moor in the bay and contrive to make a picturesque scene. Despite a large number of visitors, however, the resort never feels over crowded. There are a small number of tavernas in Paleokastritsa, with some being on the water's edge. These, however, tend to be expensive. Around the headland is an exclusive marina where the wealthy compete to see who has got the biggest boat. For the rest of us mere mortals, the view is quite special. It is possible to hire small boats locally to explore the coastline. There are also boat trips available to explore the nearby sea caves. Enjoying magnificent views over the bay at Paleokastritsa is a 13th-century monastery that has become something of a tourist trap. 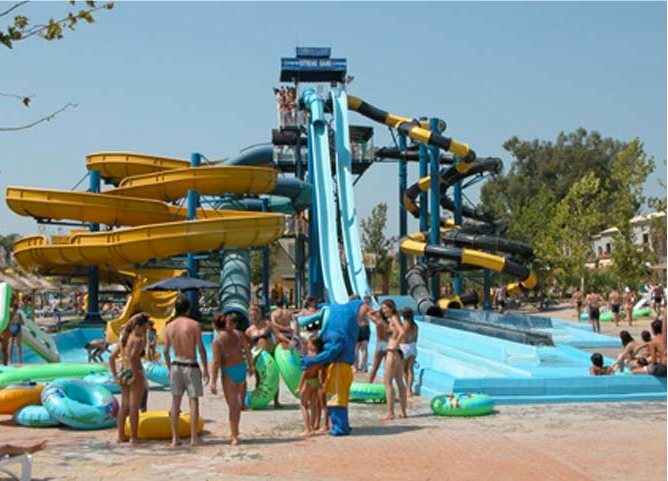 For those visiting Corfu with children, one of the "must-visit" resorts is Aqualand. Boasting 15 adventure pools, 38 different slides, a 24-metre high freefall, a 350-metre lazy river, a deep blue kayak, a180 metre family rafting river and the third largest wave pool in the world, Aqualand is one of the largest and most attractive waterparks in Europe. Alongside the waterpark is a selection of restaurants and bars as well as a health club. As such, there is plenty here to keep a family entertained for a full day. For those that wish to stay longer, Aqualand has 158 air-conditioned apartments and studios, all equipped with telephone, satellite TV, and fridge, safe box and hairdryer. The Corfu Club's beautiful course has been praised by many as being one of the best-kept golfing secrets in Europe. It was designed by the famous Swiss based architect, Donald Harradine and he has blended the natural resources of the lovely Ropa Valley with man-made hazards to make the course a good but fair test for golfers of all abilities and skill levels. The clubhouse has excellent facilities and serves lunches and snacks. During the season, the golf club holds various competitions which are open to those who wish to play. There is a horse trekking centre called Trail Riders that operates stables near the beautiful south facing village of Ano Korakiana, in the north central area of the island. 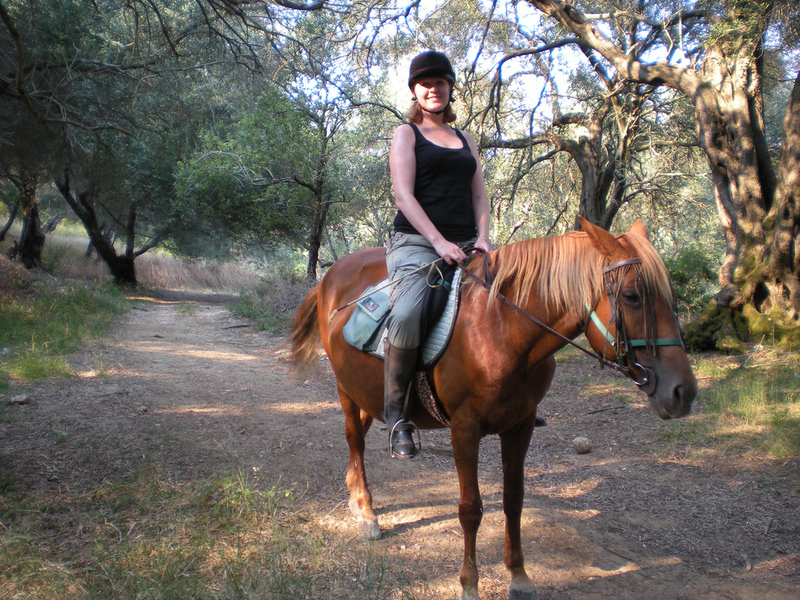 Set in the foothills of the Pantokrator mountain range, with its miles of farm tracks, it is an idyllic location for trekking on horseback. Groves of olive trees and natural woodland provide welcome shade in which to trek, even in the mid-day sun. The 11 horses are in perfect condition and their quiet natures and good manners make them suitable for riders of all abilities; from the complete beginner to the more advanced rider. Catering for people from 6 to 60, Trail Riders is open throughout the year. There are many local festivals or 'paniyiris' during the summer in Greece and Corfu is no exception. Most of the villages in Corfu have a festival at some time between July and September, particularly July and August. "The Corfiot" newspaper lists the major ones, however, there are many others that only the locals know about, so it is worth asking around. Festivals typically feature plenty of food and drink with traditional Greek dancing playing a major part of the celebrations. All are welcome to join in. Corfu, like the rest of Greece, is a deeply religious Christian region of the World. The Greek Orthodox Church has numerous churches and monasteries all over the island and most are in regular use. Whilst visitors are welcome to attend, be aware that services can take several hours. Most of the churches and monasteries are open to visitors, however, photography is typically not allowed within, so to avoid causing offence it is best to ask permission beforehand. Also, it is frowned upon to enter the buildings without first covering up; trousers are preferred to shorts and going shirtless is most decidedly frowned upon. 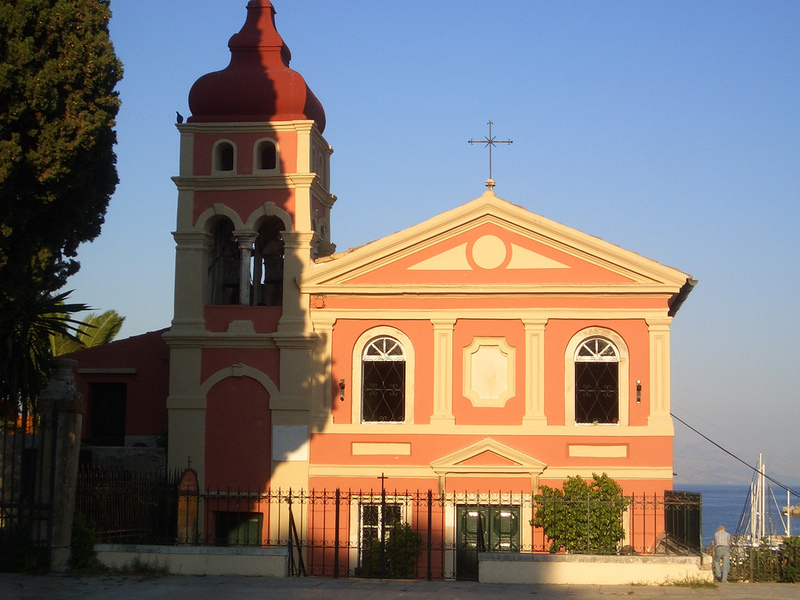 One of the most recognisable churches on Corfu is the small church called Panagia ton Vlachernon, located near the end the airport runway in Corfu Town. This picturesque little church features in most travel guides to Corfu and is built on a small man-made island that can be accessed by a narrow walkway leading out into the bay. Remember to duck if planes are approaching the runway!